SOMALILANDERS:- National Super Alliance leader Raila Odinga has maintained the opposition will not relent in its campaign for electoral reforms to give Kenyans an opportunity to elect leaders of their choice. Mr Odinga, who spoke in Kakamega Town on Sunday accompanied by Governor Wycliffe Oparanya, said Nasa would not be intimidated by the Jubilee administration to abandon the quest for free and fair elections. Mr Odinga addressed several roadside rallies on his way to Kisumu. "This country belongs to Kenyans and the people have a right to choose their leaders. We (the Opposition) will not allow leaders to be imposed on the country through fraudulent electoral process,” he said. Without elaborating, Mr Odinga asked his supporters not to give up hope as he was confident he would fix the wrongs in the election. "We are on track and I’m confident we will fix what went wrong with the elections and denied us our victory,” he said. 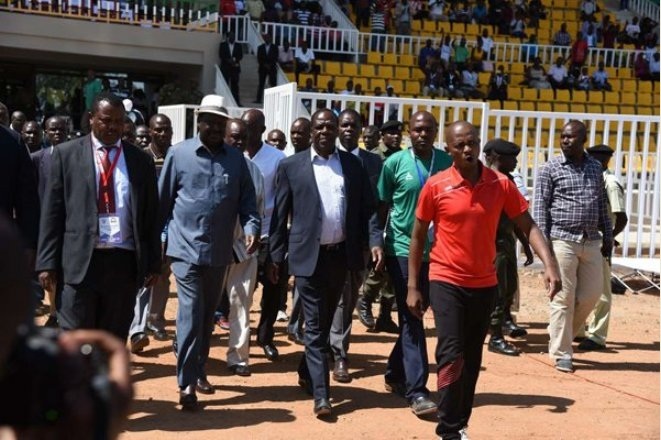 The opposition chief spoke after attending the opening match of the Council for East and Central Africa Football Association (Cecafa) between Kenya and Rwanda at the Bukhungu Stadium in Kakamega County. He said the Jubilee administration had deployed police to shoot and kill Nasa supporters who turned up to welcome him when he arrived back in Kenya on November 17, 2017 after his visit to the US. Mr Odinga said the police had shot dead 18 people and injured several others during protests following the October 26 repeat presidential elections. "We have buried seven victims of police brutality and we are planning to bury others who are still in the mortuary in the coming week,” said Mr Odinga.